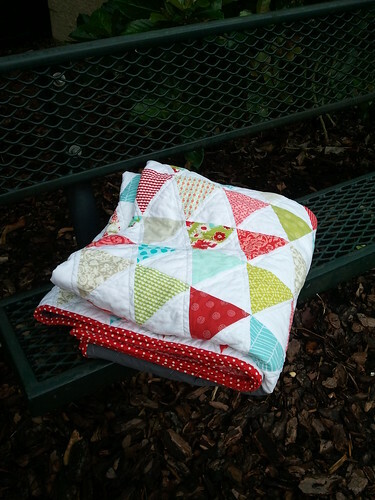 There's a charm pack of Ruby, plus some Michael Miller Ta Dots, Sandi Henderson Secret Garden, Joel Dewberry Modern Meadow, Sweetwater Reunion, and Jenean Morrison Silent Cinema. The solids are Kona White and Kona Medium Gray [I think]. And the polka dot binding is from Farm Fresh. I knew that I wanted to cut down on the sweetness of Ruby, so I chose the triangle design, and left the edges jagged. I also think that the gray helps bring down the cutesy effect. Although, truth be told, I didn't want to use gray. I've been wanting to branch out and use something other than gray and white, but I was making this on a deadline and that was what coordinated at the store. Ideally I would have used an aqua color of some sort. Another time! The backing was a real struggle for me. I didn't want to buy any more fabric, but had gotten a yard of that Ruby print really cheap, specifically for this back. But I could not get the back to something that didn't look like I just threw the leftover pieces on there. Finally, after cutting and rearranging at least 20 times, I came up with the final design. And I think the aqua Ta Dot print is what saves the back. 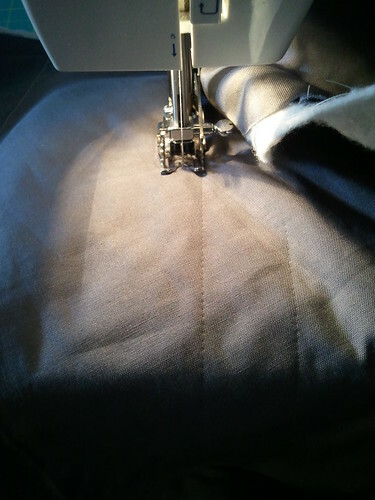 I used my pattern tracing wheel to help with the quilting and it was phenomenally helpful. I traced the seam lines from the triangles out to the edges of the quilt, so that when there were no more seam lines to follow I could still achieve straight lines [ok, they're a little wobbly in some places]. The tracing wheel does not leave a permanent mark, and is much like a hera marker. As you can see in the second picture, the quilting in the gray is both diamonds and just radiating lines, and I loooove it. Now, here's my issue with the quilt. First, I need to sew slower sometimes. 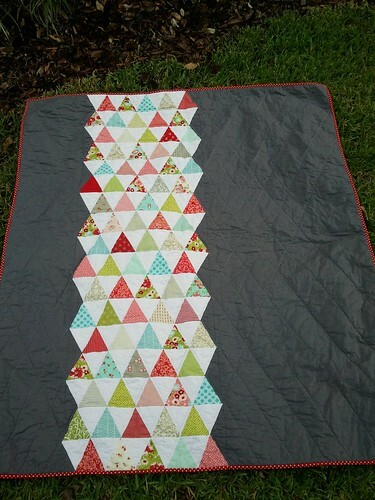 I had several triangle points that didn't match up when I sewed the rows of triangles together. Secondly, does anyone have any tips for basting on carpet? In my current apartment I baste in literally the only space that is big enough for it, and I'm sure it will be the same in my new apartment. There is no area of hard flooring for me to baste on! I've made Stephen help me with every quilt in the past, but he wasn't available to help this time, and I wasn't able to achieve the crisp, wrinkle-free basting that I needed. 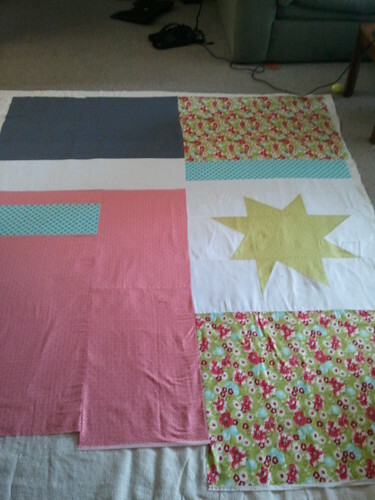 But I didn't know it wasn't good enough until I started quilting [I had fixed all the wrinkles above in the photo]. So, any help from carpet-basters would be much appreciated! Love it love it love it! What a lovely gift. Basting on carpet - I've only done it once, and I use spray baste. I first used masking tape to secure my backing, which worked well even on the carpet, and I made sure to lay out lots of old towels around the edge because let's face it, over spray is a lot easier to clean off a hard floor surface than carpet! Is the song from the Zutons? The quilt looks great! Love the triangles! 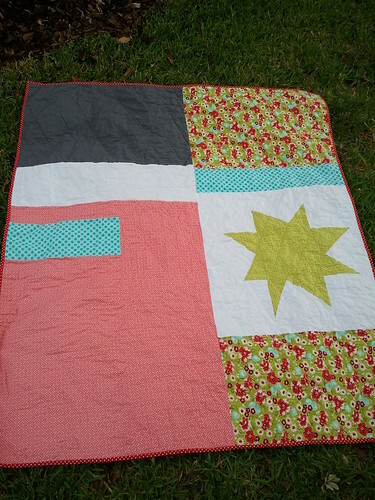 Your quilt looks great - such a great combo of fabrics - so modern. I have no tips on basting on the carpet but I'm interested in seeing what your other readers suggest. I used to baste at my dining room table, letting part of the quilt hang off the edge to create the tension needed. Is table basting an option? Very cute quilt! I like how you used the triangles. No tips here on basting on carpet. I use a folding table for basting. It's easier on my back and makes the process much quicker. Good luck! I think there ought to be a folding solid surface for sale for people like you. I have an idea in my mind. If someone would just market it. Can you get a sheet of plywood cut at DIY store and then hinge it together? That I'd what I have used in the past. You can then store it under your bed and then bring it out and use it on the floor or put it over your smaller table. Sharon Schamber has two you-tube videos showing how she bastes on a table. (I know I made my first quilt in an apartment with shag carpet everywhere [well over 30 years ago] and I don't remember clearly how I basted it, but I'm thinking I may have used those fold-able cardboard cutting mats for dressmaking and ut them on top of the bed.) Another option might be to buy sheets of foam core such as used for science fair projects and lay them on the floor first. However, if you have a long enough table, the Sharon Schamber method would be easier. When I began quilting, I was the only young woman I knew of who was making quilts. After making a 500+ mile move, I still couldn't find young women who made quilts. 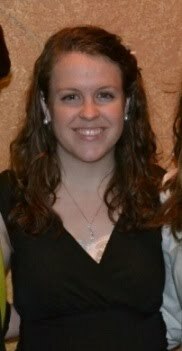 I organized a mini-show from which we launched a quilt guild, and the days of feeling alone were over. I have had to baste on carpet lots of times and I agree it is not easy. I had a wool carpet that I would use pins to stick pin the quilt to the carpet as best I could- not recommended by the way! Or I use lots and lots of tape. I have seen this foam puzzle piece "flooring" being used. A lot of knitters use it cause they can stick pins in it when they are stretching the final project. I have also seen it used as flooring in garages. Because it is a puzzle piece you buy only as much as you need and you can put it down and pick it up when you are done. Sorry I don't have a link to where you can find it. 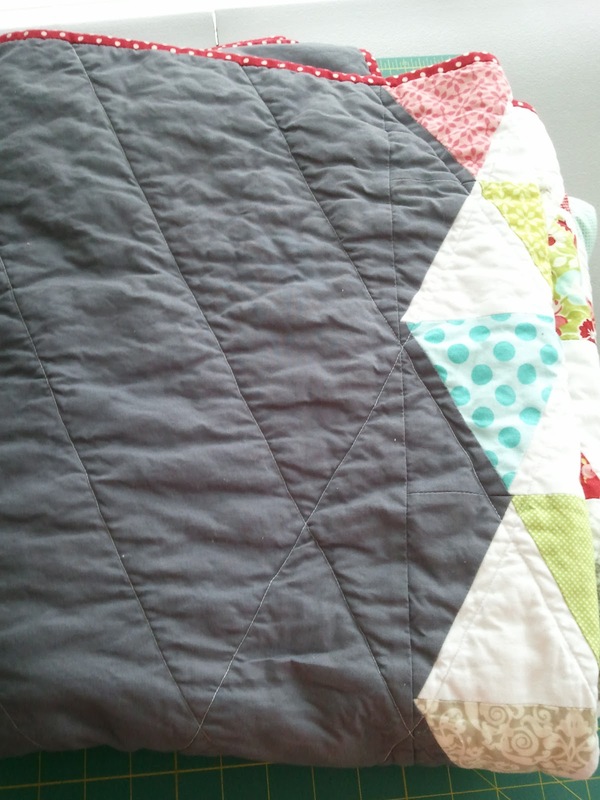 Love your quilt though, I really like the dark grey with the pop of colors. I love this design. I just bought a triangle ruler and am hoping to do something similar to this. Thanks for the inspiration! I LOVE that song! Love quilt my dear!